These mustard glazed salmon fillets are amazing! 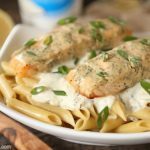 With a hint of honey, dill, greek yogurt and a smokey dijon mustard, this glaze makes for one incredibly light and delicious fish dish. This dish is pretty simple to make. The smeared salmon fillets are baked open to create beautifully glazed fillets. And while the fish bakes an easy, tangy and creamy mustard sauce is made from a handful of ingredients. I really like how the plain greek yogurt mellows out the tanginess without detecting what was in the sauce. The results are very good. Not to mention how amazing the fish smelled while it baked away. Dijon mustard goes really well with fish, so do try tho nutritious, healthy and tasty fish dish. 1.) Preheat the oven to 375 degrees F and line a baking sheet with aluminum foil. 2.) In a small bowl whisk together olive, dijon mustard, dill, honey Greek plain yogurt and salt & pepper. 3.) Drench the salmon fillets in the mustard mixture and place onto a baking sheet. Bake for 15-20 min or until done. 4.) TO MAKE SAUCE: In a small bowl whisk 2/3 cup of milk, 1/2 cup of greek yogurt, 1 tsp dijon mustard, 1 tsp of lemon juice, 1 1/2 tbsp dill, 1/8 tsp of salt & pepper. Drench the salmon fillets in the mustard mixture and place onto a baking sheet. Bake for 15-20 min or until done. 5.) Melt 2 tbsp of unsalted butter in a small saucepan over medium heat. Add the minced garlic and chopped onion. Sauté for about 3 minutes then add flour; stir until smooth. 6.) Gradually add the milk mixture and simmer over medium-low heat until smooth (1-2 min.) Remove from heat and add parmesan cheese. If sauce is too thick you can add water for desired consistency. 7.) Serve over 1 lb of your favorite cooked pasta. ENJOY! Preheat the oven to 375 degrees F and line a baking sheet with aluminum foil. In a small bowl whisk together olive, dijon mustard, dill, honey Greek plain yogurt and salt & pepper. Drench the salmon fillets in the mustard mixture and place onto a baking sheet. Bake for 15-20 min or until done. TO MAKE SAUCE: In a small bowl whisk 2/3 cup of milk, 1/2 cup of greek yogurt, 1 tsp dijon mustard, 1 tsp of lemon juice, 1 1/2 tbsp dill, 1/8 tsp of salt & pepper. Drench the salmon fillets in the mustard mixture and place onto a baking sheet. Bake for 15-20 min or until done. Melt 2 tbsp of unsalted butter in a small saucepan over medium heat. Add the minced garlic and chopped onion. Sauté for about 3 minutes then add flour; stir until smooth. Gradually add the milk mixture and simmer over medium-low heat until smooth (1-2 min.) Remove from heat and add parmesan cheese. If sauce is too thick you can add water for desired consistency. Serve over 1 lb of your favorite cooked pasta. ENJOY! This was heavenly! I didn’t have greek yogurt so I used soiur cream and it was perfect! Looks professional on the plate (I chose to plate it in the kitchen) and this is going into my main rotation!